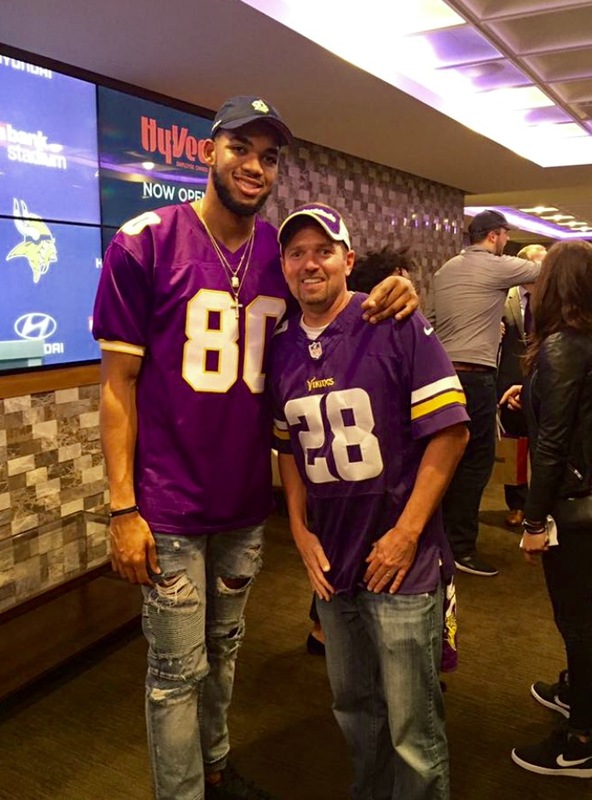 Minnesota sports fan Jonny Wright provided iFolloSports.com with this photo of he and Timberwolves budding superstar Karl-Anthony Towns. The encounter occurred at US Bank Stadium in Minneapolis, during the Vikings recent Monday Night Football matchup with the New York Giants. In the picture, Towns is donning a vintage Cris Carter jersey. During his first season in both Minnesota and the NBA, the New Jersey native absolutely took the league by storm, averaging 18.3 points and 10.5 rebounds, on his way to unanimous rookie of the year honors. Towns was selected with the first overall selection in 2015, after spending one season at Kentucky. Towns fans can check out other iFolloSports.com videos and photos, chronicling the potential all-time great, during interactions with fans.